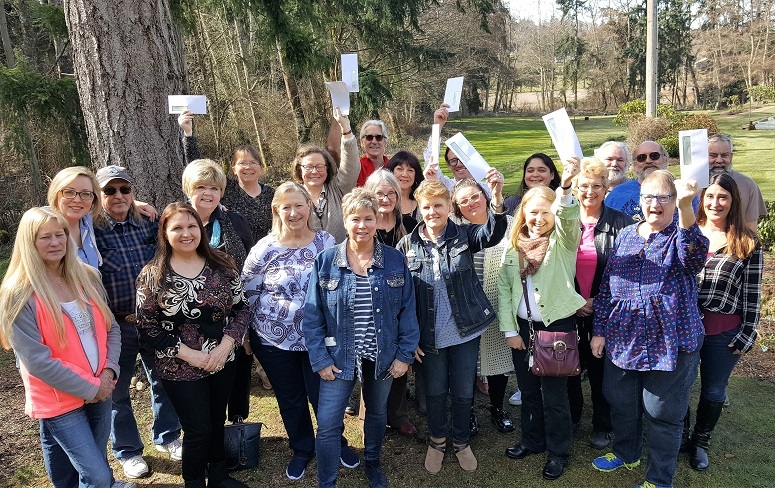 The Whidbey Island Eagles Aerie Board of Directors gathers with representatives of twelve island nonprofits after presenting the organizations with $15,000 in total. Twelve Whidbey Island nonprofits were the lucky recipients of generous contributions from the Fraternal Order of Eagles Aerie in Freeland recently. The Eagles’ mission is simple, “People Helping People,” and they certainly followed through with a heap of help last Saturday to the tune of $15,000 in total. The recipient organizations include Senior Services of Island County, Helping Hand, Enso House, the Readiness to Learn Foundation, Whidbey Island Nourishes (WIN), Friends of Friends Medical Support Fund, South Whidbey Homeless Coalition, M Bar C Ranch, the HUB Youth Center, Friends of Freeland Library, Whidbey Island Dance Theatre and South Whidbey Hearts & Hammers. On behalf of South Whidbey Hearts & Hammers, which received $2,000 to help repair homes of neighbors who are unable to do so themselves, and all the recipients of your generosity, we thank you, Eagles! Wednesday, 20th March 2019, 03:17pm.